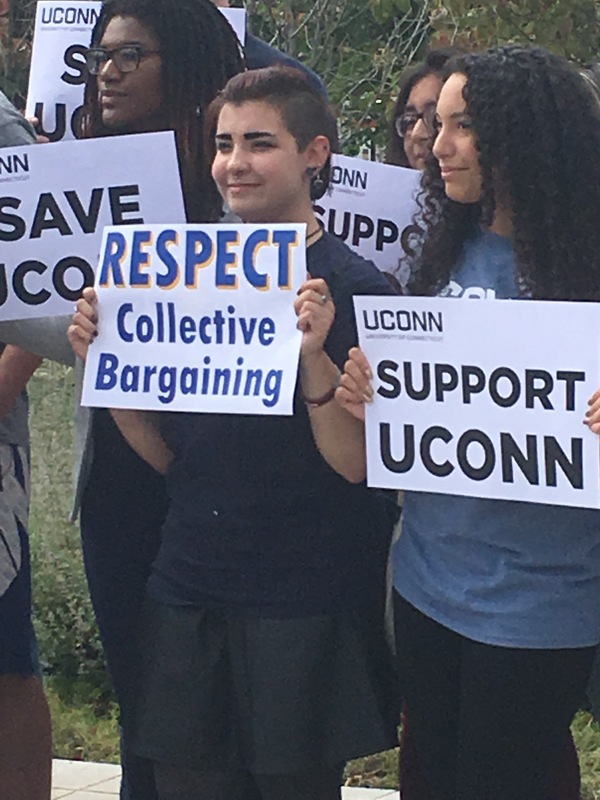 Carrying signs that read “Support UConn” and “Respect Collective Bargaining,” approximately 300 University of Connecticut staff and students rallied outside the Legislative Office Building to protest proposed cuts to the university included in the bipartisan budget passed by the legislature. Former UConn graduate employee union president, Todd Vachon, led the crowd in chanting “tax the rich” and called for raising taxes on hedge funds and Connecticut’s top income earners. 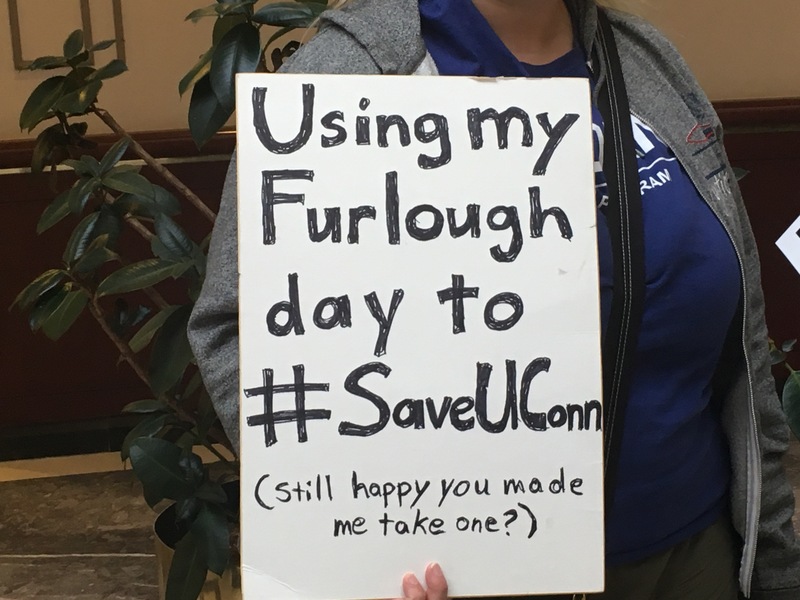 “Rather than making those billionaires pay the same rate we pay, they decide to cut $300 million from UConn,” Vachon said. The rally was joined by Senators Beth Bye, D-West Hartford and Mae Flexer, D-Danielsen, and Representative Robyn Porter, D-New Haven. The state’s contribution to the University of Connecticut has continued to grow over the years. In 2015, the state of Connecticut paid $600.5 million to its flagship university. In 2017, that figure grew to $799.3 million, according to the state comptroller’s website. UConn administration have been quick to point out that the university was recently ranked 18th best public university in the nation by U.S. News & World Report. The university and UConn Health also produce some of the highest paid public employees, who then become the highest paid pensioners. Former UConn business professor, John F. Veiga, receives a pension of over $300,000 per year, the highest in the state. Staff from UConn Health Center also attended the rally and warned that the Health Center wouldn’t be able to survive the cuts proposed in the budget. University Health Professionals local 3837 president and registered nurse at UConn Health Center, Bill Garrity, warned the Health Center could be shut down. UConn Health Center has been plagued with poor fiscal health, carrying over deficits year to year. The Health Center is looking at a deficit of $59.4 million this year, which includes debt rolled over from 2016. A major component of the problem is the hospital’s pension and retiree health obligations, which grew by $27 million this year alone due to payments toward the unfunded pension liabilities. The pension costs make up 69 percent of the $39 million in increased expenses this year. The state has also invested significant funds in the Health Center, including $255 million for a patient tower, parking garage and outpatient center in 2011 and an additional $291 million in bringing Jackson Laboratories to the campus in 2011. But it hasn’t been enough to keep the Health Center from falling into deficit each year. Debt service, unfunded pension liabilities and retiree healthcare are known as “fixed costs” and are rapidly growing, outpacing tax revenue and fueling the current budget crisis. The bipartisan budget passed last week makes significant changes to the way pensions are set starting in 2027 when the current benefits package expires. In July, the legislature approved a union concessions deal which guarantees layoff protections for employees and extends the benefits contract to 2027. However, union groups have been holding rallies at the Capitol calling on the governor to veto the budget because it contains reforms to Connecticut’s collective bargaining process, such as requiring a vote on every union contract and setting retirement benefits in state statute after 2027. A rally held on the steps of the Capitol building on Thursday by the Working Families Party drew between 100 and 200 people.